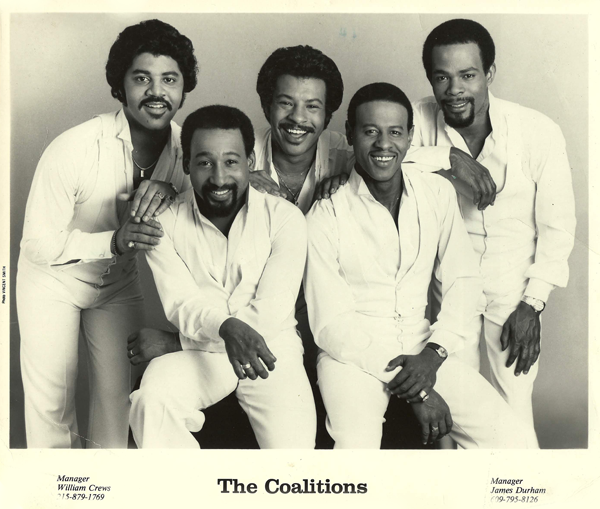 The Coalitions story began with their founding member, Philadelphian William Anthony Anderson who under the Stage name Of “Little Tony Talent” recorded “All That’s Good/Your Too Young” for Juggy Murray’s Symbol Label in 1966. Tony recorded his second and final solo release the Van McCoy penned and produced “Gotta Tell Somebody (About My Baby)/ Hooked On You”, released in 1967 on the New York based Vando label, which McCoy co-owned with partner Jocko Henderson. Tony who was still only fifteen at the time continued to enter local talent shows in and around Philadelphia and after being beaten on a couple of occasions by vocal groups, he thought the best way forward was to form a group of his own. So with high school friends Alan Williams, Bruce Dunbar and Carl Smith, Tony formed a group known as the “Deltones”. The Coalitions first recording “Instead … How Are You/I Don’t Mind Doin’ It (Instrumental)” appeared on the local “Re Dun” label in 1974. This release was picked up later in the same year by the nationally Jamie/Guyden distributed Phil. LA Of Soul label (367) a second release (371) of “Instead … How Are You” was issued in early 1975 this time dropping the instrumental flipside in favour of a vocal outing “Later Than You Think”. After the Phil. LA Of Soul adventure The Coalition entered a barren period recording wise during which time Bruce Dunbar left the group. His position would later be filled by Bruce Fauntleroy, with a fifth member Stephen Ferguson also joining the group. In circa 1980 with the group line up of Tony Anderson (Talent), Alan Williams, Bruce Fauntleroy, Milton Williams and Stephen Ferguson The Coalitions embarked on a vanity project to record the “Colour Me Blue” album. Although the project was completed, due to lack of finance the finished product was never issued. 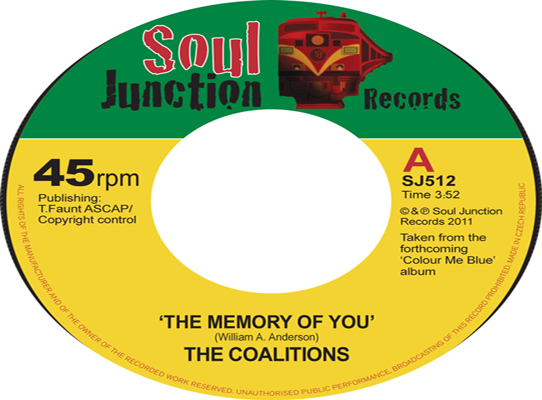 Finally after a 30 year wait this situation is about to be rectified as the following two tracks “The Memory Of You” and “ On The Block” are soon to be released on the UK based Soul Junction Label (SJ512) as a lead 45 for their future release of the aforementioned “Colour Me Blue” album. Bruce Fauntleroy, Alan Williams, Tony Anderson (a.k.a Tony Talent), Milton Williams and Stephen Ferguson.